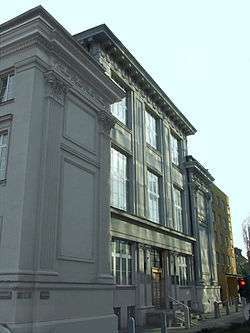 The Jewish Historical Institute (Polish: Żydowski Instytut Historyczny or ŻIH) also known as the Emanuel Ringelblum Jewish Historical Institute, is a research foundation in Warsaw, Poland, primarily dealing with the history of Jews in Poland. The Jewish Historical Institute was created in 1947 as a continuation of the Central Jewish Historical Commission, founded in 1944. The Jewish Historical Institute Association is the corporate body responsible for the building and the Institute’s holdings. The Institute falls under the jurisdiction of the Ministry of Culture and National Heritage. In 2009 it was named after Emanuel Ringelblum. The institute is a repository of documentary materials relating to the Jewish historical presence in Poland. It is also a centre for academic research, study and the dissemination of knowledge about the history and culture of Polish Jewry. The most valuable part of the collection is the Warsaw Ghetto Archive, known as the Ringelblum Archive (collected by the Oyneg Shabbos). It contains about 6000 documents (about 30 000 individual pieces of paper). Other important collections concerning World War II include testimonies (mainly of Jewish survivors of the Holocaust), memoirs and diaries, documentation of the Joint and Jewish Self-Help (welfare organizations active in Poland under the occupation), and documents from the Jewish Councils (Judenräte). The section on the documentation of Jewish historical sites holds about 40 thousand photographs concerning Jewish life and culture in Poland. The Institute has published a series of documents from the Ringelblum Archive, as well as numerous wartime memoirs and diaries. Also, for over 60 years now, the Institute has been publishing an academic journal renamed in 2001 as The Jewish History Quarterly, registered on the Master Journal List of outstanding academic journals in 2011. In 2011, Paweł Śpiewak, a Professor of Sociology at Warsaw University and former politician, was nominated as the Director of the Jewish Historical Institute by Bogdan Zdrojewski, Minister of Culture and National Heritage. Wikimedia Commons has media related to Żydowski Instytut Historyczny. 1 2 3 The Jewish Historical Institute, homepage. ↑ Jewish Historical Institute, The Jewish History Quarterly. ↑ Uncredited, Change at the top Archived February 3, 2009, at the Wayback Machine. ; Jewish Historical Institute. Retrieved 2012-07-29.